This post applies Limited Pattern Overlay, the sysudokie’s POM, to an Andrew Stuart Unsolvable, #40. The interplay of coloring and LPO patterns ties this beast up for the kill. The patterns for 6, 8 and 9 are restricted by coloring. If a pattern contains a candidate of one color in a cluster, it cannot contain the opposing color. Patterns assign colors to candidates, but not as strongly as nets of slinks. There are no color traps in pattern coloring. But confirmed candidates can prove patterns and true colors. Now we transfer this information to conflict tables, in which patterns are listed in rows, and conflicts with other patterns are posted along the rows. 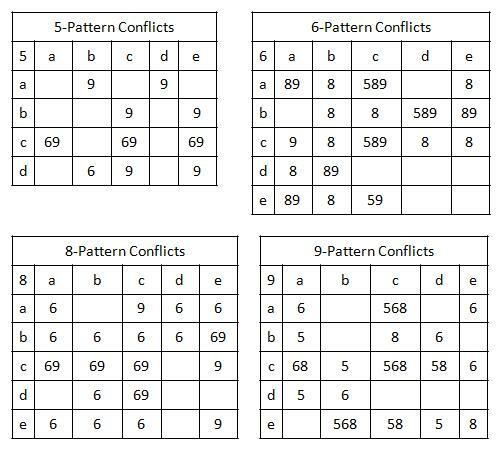 Pattern 8b is eliminated, because it conflicts with every pattern for the number 6. Note how this is restated in both the 6 and 8 conflict tables. The combination 6c and 9a is prohibited, because 8a is the only 8-pattern that 6c allows, and 9a conflicts with 8a. 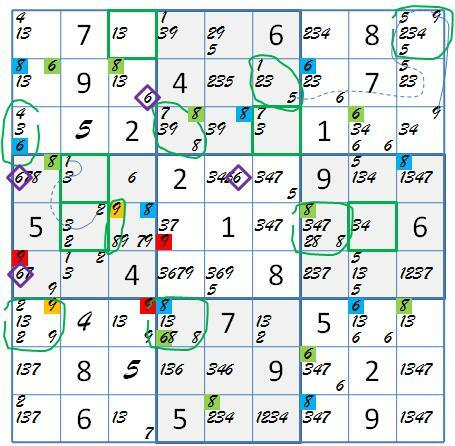 The next strongest conclusions are from almost completed rows, that 6a => 8d, 6b or 6c => 8a, ! (8a&9a), 8c => 9d, and 9c or 9e =>5a. 8c => !8a and !8d => ! 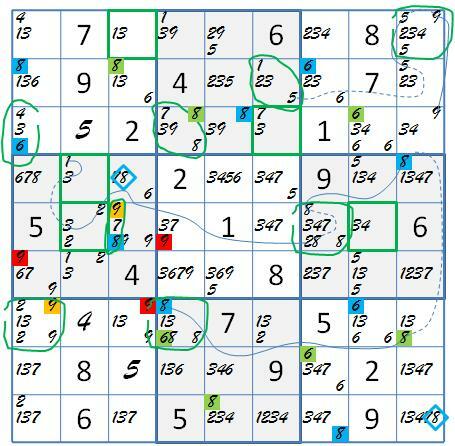 (6b or 6c)and !6a =>!6a and !6b and !6c => 6d or 6e => blue. What is the impact on the grid of these conclusions? No change in the 8 candidates results from the elimination of 8b, but the determination of the 8-pattern is certainly closer. We can “blue” only the 8c candidates that belong to the 8c pattern exclusively, but this is enough to merge the pink / purple and blue / green patterns. The merged blue /green eliminates candidates of patterns b and e. The coloring of patterns for the number 6 has eliminated patterns of number 8! 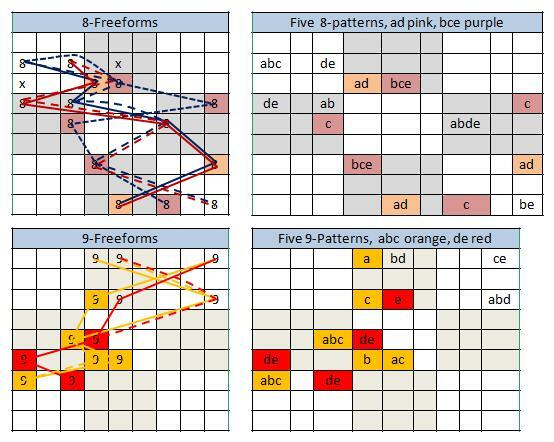 The removal of pattern e leaves pattern d alone to turn two more 8 candidates green, completing the blue / green extension over number 8 and trapping two more 8-candidates, removing pattern 8a. We are left with patterns 8c (blue)and 8d (green)! 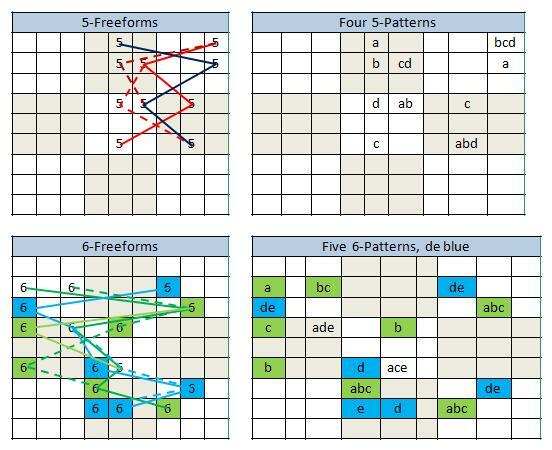 Going back to our conflict logic, !8a => !6b and !6c, so the 8 patterns return the favor to the 6 patterns, and 6a becomes the champion of green while 6d and 6e represent blue. Let’s catch our breadth and allow you to follow up on these revelations. Maybe you can polish off Unsolvable 40 from here. This entry was posted in Extreme Solving and tagged LPO, Medusa coloring, pattern enumeration, pattern overlay, POM, Unsolvable 40. Bookmark the permalink.